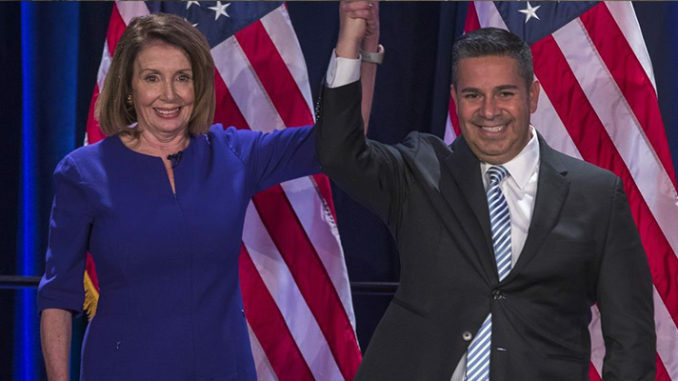 House Democratic Leader Nancy Pelosi of Calif., left, waves with DCCC Chair Ben Ray Luján, as they arrive to speak about Democratic wins in the House of Representatives to a crowd of Democratic supporters during an election night returns event. If Nancy Pelosi once again becomes the Speaker of the House, she will owe Latino voters a vote an Immigration in the House. Ever since Democrats lost the House of Representatives in the 2010 Mid-term election, Nancy Pelosi and Minority Whip Steny Hoyer have been screaming for a vote on an Immigration Bill to revamp our “Broken Immigration system.” When the Bipartisan Immigration Bill S.774 passed in the U.S. Senate, Nancy Pelosi and every single Democrats in the House accused former Speakers of the House John Boehner and all Republicans in the House of “obstructionists” for now allowing a vote an that Immigration Bill. Moreover, since 2013, when the U.S. Senate passed S.774, Democrats have accused Republicans of “obstructing” an Immigration Bill to pander to hardliners and passing only partisan “Enforcement only” bills. But, this Mid-term election, the American people have given Democrats the chance to pass the kind of Immigration Bill they’ve been screaming about since 2011 when they lost the House, and now they will have opportunity to show Latino voters that they honestly care about them. Nancy Pelosi and Democrats in key House Committee chairmanships, like the Judiciary Committees, who will now have control over Immigration laws have been promising and Immigration Bill for years to Latino voters and to those Hispanic legislators from Congressional districts with large Latino voting blocs. 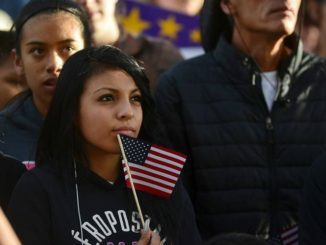 So they really owe this Immigration Bill to Latino voters. 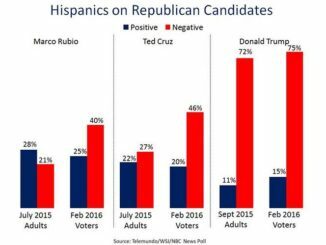 It’s been eight long years since Democrats lost the House, and it’s been eight long years for the Hispanic community that has suffered high deportation numbers under Obama and now live under constant “threat” of deportation under Trump, according the New Pew Hispanic survey. As a result, Latino voters, and those Representatives from districts with large Hispanic populations, should be bold and demand that Democrats in the House vote on an Immigration bill because in 2009, when Democrats took the House and the Senate, Nancy Pelosi deliberately avoided pushing an Immigration Bill in the House; Pelosi, and then Obama’s Chief of staff Rahm Emanuel, did not want to touch Immigration to focus more on Obamacare. This is the time when many Democrats like Luis Gutierrez openly accused Pelosi and Obama of only using Latinos for votes. Historically, the House of Representatives has always been the problem to tackle Immigration. On Dec. 16, 2005, the House passed the Border Protection, Anti-terrorism and Illegal Immigration Control Act of 2005 (H.R. 4437) more commonly known as “the Sensenbrenner Bill.” The passage of H.R. 447 spurred large demonstration across the nation forcing the U.S. Senate to passed “McCain-Kennedy” comprehensive reform bill. Under the leadership of Republican Senate Majority Leader Bill Frist and President George W. Bush, the Senate passed the “McCain-Kennedy” bipartisan comprehensive Immigration bill with 65 votes. However, because the House, under the leadership of Speaker Dennis Hastert, refused to meet in Conference to iron out the differences between the “the Sensenbrenner Bill” and the “McCain-Kennedy” bill, the Immigration Bill died. In 2006, when Democrats took control of both Houses of Congress, Nancy Pelosi became House Speaker and Rahm Emmanuel became Pelosi’s top lieutenant. There, too, Emmanuel worked hard to keep the immigration issue off the Democratic agenda because he feared it could put him and his colleagues in a tough spot. And although in 2006, Democrats took control of The House and In the Senate with a simple majority 51-49, the Senate failed to pass an immigration bill in 2007 since Democrats did not have 60 votes, and Nancy Pelosi and Emmanuel conveniently avoided the issue. When Democrats won a Super Majority in 2008, there was great expectation that Democrats, under the leadership of Obama, will take Immigration in the first 100-days. But, Rahm Emanuel, who became President Obama’s chief of staff in early 2009, allegedly persuaded Obama to distance himself from an Immigration Bill and asked Pelosi to push Immigration to the “back burners,” despite repeated promises that Obama and Pelosi usually made before Latino audiences, mostly Mexican-Americans across the Southwest. It is well known that Rep. Luis Gutiérrez (D-Ill.) openly clashed with President Obama’s former chief of staff in years past over Emanuel’s positions on immigration reform. As a congressman heading the Democrats’ campaign arm a decade ago, then-Rep. Emanuel infuriated immigrant-rights advocates, when he warned that immigration reform was the “third rail of American politics” — a message he echoed as Obama’s chief of staff. The tension reached a point that, when Obama named Emanuel his point man on immigration reform in 2009, it was seen by Hispanic lawmakers as a near-guarantee that nothing would be done. “Telling us Rahm was in charge sent a clear message — nobody was in charge,” Gutiérrez wrote in his 2013 memoir, Still Dreaming: My Journey from the Barrio to Capitol Hill. When Republicans took over the House in 2010, Democrats did try to rush a Dream Act Bill during the lame-duck session of Congress in late December, and they succeeded. However, the bill died in the Senate 55-45 with 5 Democrat Senators voting No. Conversely, House Democrats showed considerably support among for a Senate-style comprehensive overhaul that includes both border security and a pathway to citizenship, including the Dream Act. Note: When the U.S. Senate pass S. 744, DACA had already been signed by Obama on August of 2012. In the 2014 Mid-term election, Democrats lost their majority in the U.S. Senate; and there hasn’t been any serious Immigration bill in Congress since the Senate Immigration bill S.744 in 2013. However, for the past eight years, Nancy Pelosi, Steny Hoyer and every single Hispanic member of Congress have accused Republicans of “obstructionism.” For the past eight years, Democrats in the House have pleaded for a bipartisan Immigrating bill from the Senate and from Republicans in the House. For eight years, Democrats in the House have promised millions of Latino voters that they would pass an Immigration Bill if they had the majority in the House. They do now. 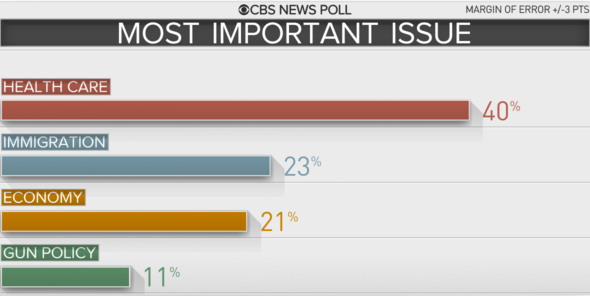 Exit polls show that 40% of voters said healthcare was the most import issue followed by immigration at 23% and the economy at 21% and ” almost half (48 percent) of voters feel that President Trump’s immigration policy is too tough.” In Nevada and New Mexico, states that tend to be libertarian, Trump decimated Republicans. In those states, Democrats took over the governorships, won the U.S. Senate races and all House congressional seats – with the exception of NV 2 – and Nevada now has two women in the U.S. Senate like California. In Arizona, Kyrsten Sinema beat Martha McSally to become Arizona’s first female senator. And. In California, of the 14 House districts Republicans held, they may end up losing as much as 6-7, that is out of 53 Congressional seats, and Democrats in California are on track to have an Supper Majority in the Legislature. And we all know that Beto did in Texas. What this meant is that the voters knew what Democrats were going to do on Immigration, and the voters entrusted them with the House majority where Democrat will have more than 235 House members. This all happened in an Mid-election where Trump tried to portray Democrats as “open borders” and supporting criminal illegal Hispanics “invaders” in the caravans. It is time for Nancy Pelosi to deliver on her promises and not to do the same mistakes of 2006 and 2009. She owes Latino an Immigration Bill. And Pelosi should not make the excuse that Senate “will not take the bill” and that the President won’t sign it. Pelosi owes Latino voters a vote an Immigration. Let Chuck Schumer and Mitch McConnell in deal with Trump and seek a compromises.